Provide comfort for the family of James Thoma with a meaningful gesture of sympathy. James Francis Thoma, of Lebanon, died on March 11, 2019. Jim was born April 27, 1935 in Stayton, OR. He was the son of Leonard and Veronica (Hiatt) Thoma. 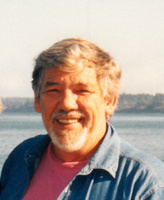 Jim attended Stayton School until the family moved to Lebanon in 1948. He graduated from Lebanon High School in 1954. Jim worked for Shimanek’s Bakery for many years, then as a truck driver for the remainder of his working life. Jim was a member of the Moose Lodge, Knights of Columbus, and the Lebanon Elks Lodge 1663. Jim enjoyed gardening and fishing. He loved to travel and always had a soft spot for dogs. He married his high school sweetheart, Alicia Shimanek in 1955. Together they raised a family and cared for foster children. Alicia preceded him in death in 1993. He married Jackie Rose in 1994. Jim is survived by his brother, Richard Thoma of Lebanon OR, four children, Tracy (Mark Edwards) of Lebanon, Tawny Gala of Mercer Island WA, Tony Thoma of Reno NV, and Jamie Baca of Las Vegas NV, one foster-child, David Koroush, along with 7 grandchildren Cory (Angelic Thoma), Jock Edwards, Sean Edwards; Christopher Baca, Gabrielle (Dan Scott); Jack Gala (Marquex), Anne Gala and 5 great grandchildren, Caden, Kenzi, Ava, Avery, and Walter. He is also survived by his wife, Jackie, along with step-daughter Sheri Gray-Grimm of Salem OR, 2 granddaughters Angelica Stokes and Marci Grimm, and 2 great grandchildren, Jayza and Tyler. Recitation of the Rosary will be at 7:00 pm, Tuesday, March 19, 2019 at Huston-Jost Funeral Home. A Funeral Mass will be held at 11:00 am, Wednesday, March 20, 2019 at St. Edward Catholic Church, a luncheon will follow the service. A private family interment will be in the Lebanon I.O.O.F. Cemetery. To send flowers in memory of James Francis Thoma, please visit our Heartfelt Sympathies Store. Recitation of the Rosary will be held at 7:00 pm, Tuesday, March 19, 2019 at Huston-Jost Funeral Home. Provide comfort for the family of James Francis Thoma by sending flowers.